TV BANTER . . . with Joanne Madden: Larry Hagman: So long, J.R.Ewing! Larry Hagman: So long, J.R.Ewing! It was truly an honour to share the screen with Mr. Larry Hagman. With piercing wit and undeniable charm, he brought to life one of the most legendary television characters of all time. But to know the man, however briefly, was to know a passion and dedication for life and acting that was profoundly inspirational. Larry Hagman passed away on November 23, 2012 at the age of 81. The actor, who underwent a life-saving liver transplant in 1995, reportedly died of complications from stage 2 throat cancer. Larry's friend, writer Harry Hurt III, has claimed, however, that Hagman was also battling leukemia. According to Hurt, leukemia was the actual cause of his death. Yet, no matter how ill he was, Larry was loathe to miss an opportunity to continue his role on Dallas. During the show's original run from 1978 to 1991, he was the only actor to appear in all 357 episodes. Larry Hagman's role as the ruthless oilman, J.R. Ewing, won him worldwide recognition and many accolades. He became one of television's most unforgettable villains and Dallas fans couldn't wait to tune in every Friday night to watch J.R's. dirty schemes unfold. With his trademark Stetson hat and devilish smile, Hagman seemed to relish playing the conniving cowboy. Just like his character on Dallas, Larry was a true son of the Lone Star State.. He was born Larry Martin Hagman on September 21, 1931 in Fort Worth, Texas and, fittingly, he passed away at the Medical City Dallas Hospital in Dallas. His family and close friends had joined him there for the American Thanksgiving holiday. According to the Dallas Morining News, his co-stars, Patrick Duffy and Linda Gray, were at his side when he passed away. Larry Hagman was the son of Broadway star Mary Martin and Benjamin Jackson Hagman, a lawyer and district attorney of Swedish descent. Larry's parents divorced when he was only 5 years old. After the breakup, Larry moved to Los Angeles to live with grandmother while his mother struggled to achieve a show business career. She went to so many auditions that she earned the nickname "Audition Mary." Meanwhile, Larry's grandmother took care of him most of the time. When Hagman was 12 years old, his grandmother passed away and he was reunited with his mother in New York. By that time, Mary Martin had made a name for herself on Broadway. She had also married for the second time, to Richard Halliday. Larry was then sent to boarding schools until he returned to Texas to live with he father in a small town called Weatherford After graduating from Weatherford High School, he spent a year a year at Bard College in Anandale-on-Hudson, New York. It was during that time that he decided to follow in his mother's footsteps. In 1950, Larry Hagman launched his professional stage career by appearing in small roles with Margo Jones Theatre-in-the-Round in Dallas. He then performed in the New York City Center's production of Shakespeare's The Taming of the Shrew. After a year of regional theatre, he moved to England and joined the cast of his mother's hit musical, South Pacific. In 1952, during the Korean War, Larry enlisted in the United States Air Force. Stationed in London, he produced and directed several shows for U.S. troops based in the United Kingdom and elsewhere in Europe. Larry remained in England for five years, returning to New York City in 1956 after completing his military service. He then resumed his theatrical career, appearing in several Off-Broadway and Broadway productions. He also began appearing in many television programs, mostly live. At the age of 25, he made his TV debut in a 1957 episode of Decoy, a crime drama about an New York City policewoman. The episode was entitled "Saturday Lost" (Season One, Episode 24). In 1957, Larry also appeared in the daytime soap opera The Edge of Night as Curt Williams. In 1958, he performed guest roles in three episodes of Sea Hunt , an adventure series starring Lloyd Bridges as scuba diver Mike Nelson. The episodes were "The Hero," "Legend of the Mermaid" and "The Sponge Divers." From 1961 until 1963, Larry had a role in another daytime drama, Search for Tomorrow, in which he played Ed Gibson / Johnny Collins. He was such a key element in my life for so long and even, years after I Dream of Jeannie; our paths crossed so many times. Throughout various productions I had the pleasure of watching the Texas Tornado that was Larry Hagman. Amidst a whirlwind of big laughs, big smiles and unrestrained personality Larry was always, simply Larry. You couldn't fault him for it, it was just who he was. I am so thankful that in this past year I was able to spend time with him and experience yet again 'Larry' in all his Big Texas bravado. In The Good Life, Larry and Donna Mills (who later starred in Dallas spinoff Knott's Landing) played Albert and Jane Miller, a bored middle-class couple who pose as a butler and cook for a wealthy industrialist. In Here We Go Again, Larry and Diane Baker portrayed Richard and Susan Evans in a comedy about newlyweds who move into a house located near the homes of their former spouses. Both series failed to make waves and Hagman's career remained in the duldrums until the opportunity to play J.R.on Dallas came along in 1977. He credited his real life spouse for persuading him to take the role. 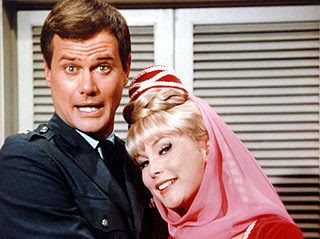 Larry Hagman met Swedish-born designer named Maj Axelsson (her first name is pronounced "My") while he was stationed in England during his service with the United States Air Force. The couple married on on December 18, 1954.and they had two children, a daughter named Heidi Kristina (born February 17, 1958) and a son, Preston (born May 2, 1962). In 2008, Maj was diagnosed with Alzheimer's Disease. Sadly, she is now in the advanced stages of the disease and is attended by live-in nurses. Larry never had the opportunity to say goodbye to his wife of almost 58 years because Maj's assisted living facility is located in California. Years of hard drinking damaged Larry Hagman's health. In 1992, he was diagnosed with cirrhosis of the liver. A cancerous tumour later developed and on August 23, 1995, he had a liver transplant. The 16-hour operation saved his life and Larry was gifted with several more years to enjoy. In a statement released on October 14, 2011, he announced that that had a form of cancer, but did not elaborate. 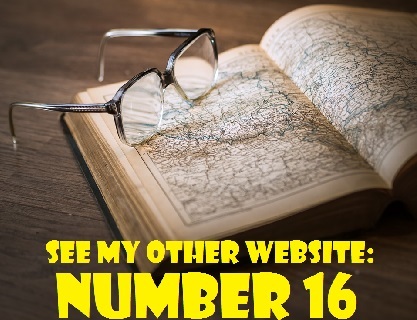 , "As J.R., I could get away with anything - bribery, blackmail and adultery. But I got caught by cancer. I do want everyone to know that it is a very common and treatable form of cancer. I will be receiving treatment while working on the new Dallas series. I could not think of a better place to be than working on a show I love, with people I love." Despite the cancer diagnosis, Larry was determined to play J.R. on the new Dallas series. His 50-year-old son, Preston Hagman, said, "Doing Dallas is what kept him alive as long as he did." Preston told ET that his father just loved coming to work every single day . . . It wasn't about the money, it wasn't about the fame, it was about him acting. That's what he did." What does Larry Hagman's death mean for the future of the revamped Dallas. Its second season is set to begin on January 28 and Hagman had already filmed six of its scheduled 15 episodes at the time of his passing. During the first season, :Larry appeared in 10 episodes while undergoing treatment for cancer. It was obvious from his appearance that he was quite ill. He was gaunt and frail-looking but the spark was still there. Dallas producers will now have to work hard to create a worthy send-off for a character of such impact. J.R.'s exit should be as memorable as the character himself. Dallas will certainly continue but it cam never be the same without Larry Hagman and his portrayal of the wily J.R. Ewing. Josh Henderson, who plays J.R.'s son John Ross in the current series, described his television father as "the most famous villain in TV history." As for the man who brought the dastardly oil baron to life, Dallas co-star Linda Gray put it best when she wrote that "Larry Hagman was one of a kind and will be with us all forever." * Mary Martin, Larry Hagman's mother, died of colon cancer on November 3, 1990 at the age of 76. She passed away at her home in Rancho Mirage, California. * Larry Hagman quit drinking, smoking and became a vegan for health reasons. * Larry remained silent for one day a week in order to discipline himself. * Larry's final guest-starring role was on Desperate Housewives in 2004. * Hagman liked motorcyles and owned a Harley. 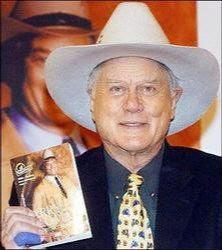 * Larry Hagman published a 2001 memoir titled Hello Darlin: Tall (and Absolutely True) Tales About My Life. Rowan Atkinson: No more Mr. Bean?